First task was to look through my drawings for texture, colour effects and proportions, looking for interesting texture and colour. 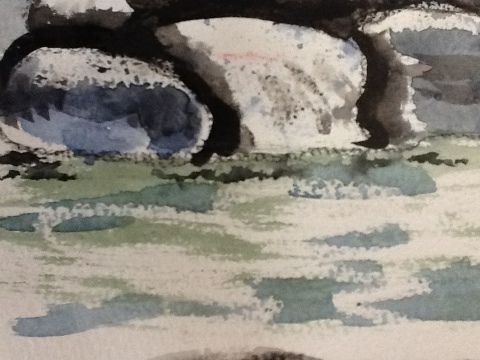 I chose my watercolor sketch inspired by a photo I had taken of some steps and rocks leading down to water. 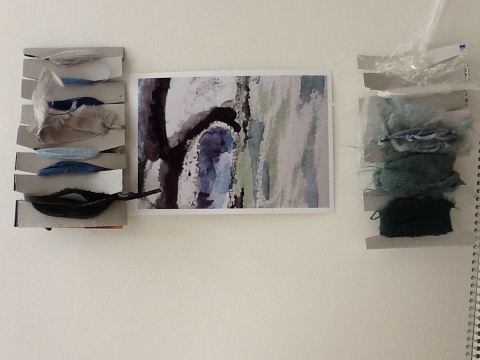 I liked this piece as it had a range of colours, which appealed, and a range of textures. I thought it would be an interesting exercise to find ways of representing the contrasts in colours and texture between the rocks and the water. It would also be a challenge to represent the reflections in the water. I chose an area of the drawing I thought would work well and enlarged the area and printed it out on photo paper. 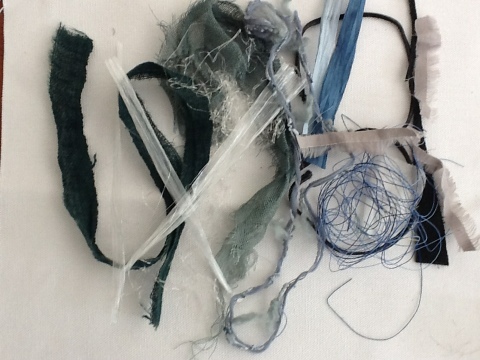 I then looked through my bags of yarns, threads and fabrics and chose a selection of materials to match the colours in the drawing. I laid them all out in a pile. 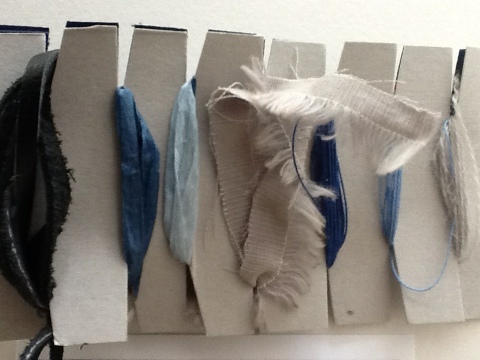 I chose black suede strips which I thought would work well for the shadows in the rocks, some mid- and light-blue raffia, blue embroidery thread, some strips of grey cotton which had frayed, some knobbly blue wool and a range of green hemp and ribbon. 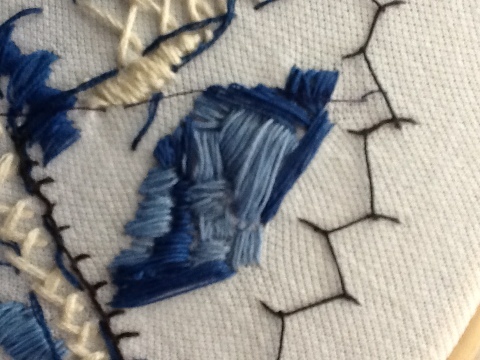 I also looked through my stitched samples form previous exercises to think about which techniques may work. I thought using a mixture of light and darker blue satin stitch with embroidery thread would work well for the rocks. 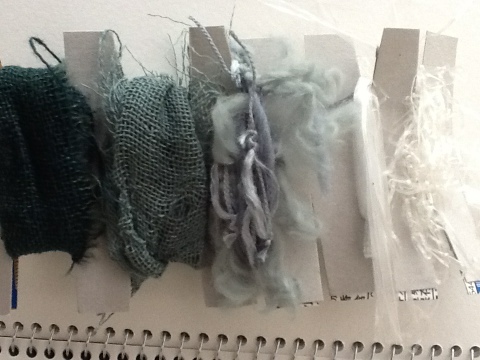 The knobbly blue wool used on another sample may work well for some of the ripples in the water. I then tried to arrange them roughly to correspond to the areas of the drawing in able to assess the proportions I would need for the piece. 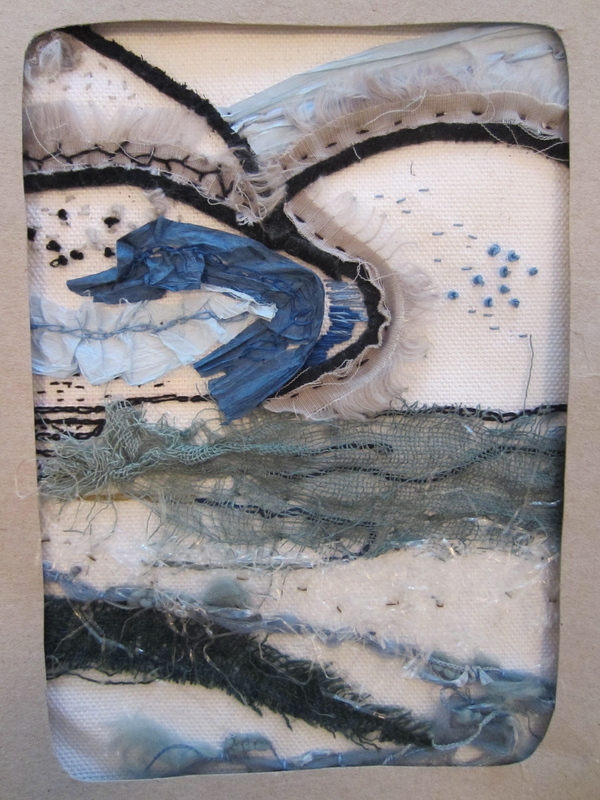 I didn’t use all the pieces initially selected but added some pieces of transparent string and packing material which I thought may represent the reflective quality of the water. 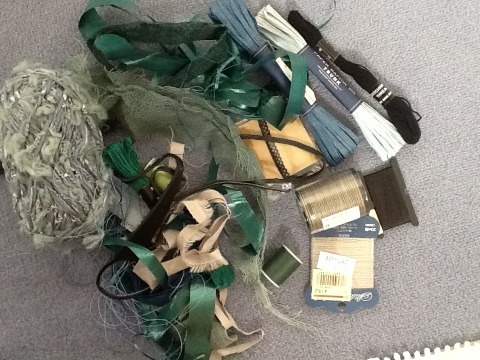 I then wrapped the yarns in the relevant proportions around two strips of card: one for the rocks and one for the water. …and then got to work on the piece. I started off with the rock area, couching some black suede and then added some seeding and French knots to give a feeling of texture. 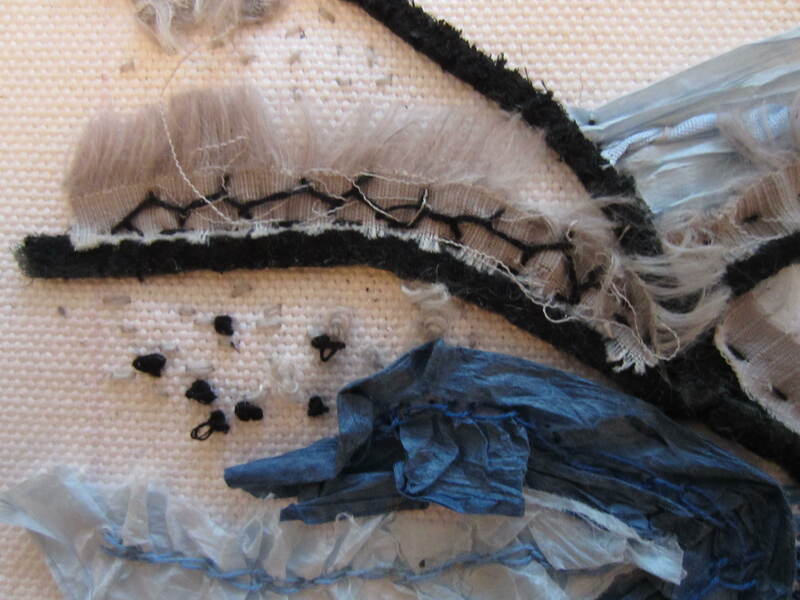 I used the grey strips of frayed cotton to give shadows, hoping that the fraying fabric would help give a blended feel. I also stitched on pieces of raffia and added some satin stitching in shades of blue to help give a contoured look to the rocks. To show the ripples in the water I used chain stitch and couched some blue wool. 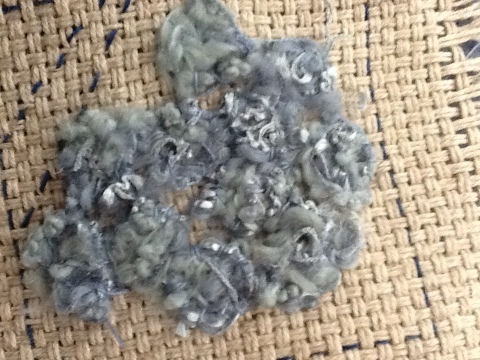 I then added pieces of hemp from which I had removed some of the threads and manipulated to give a feeling of movement. 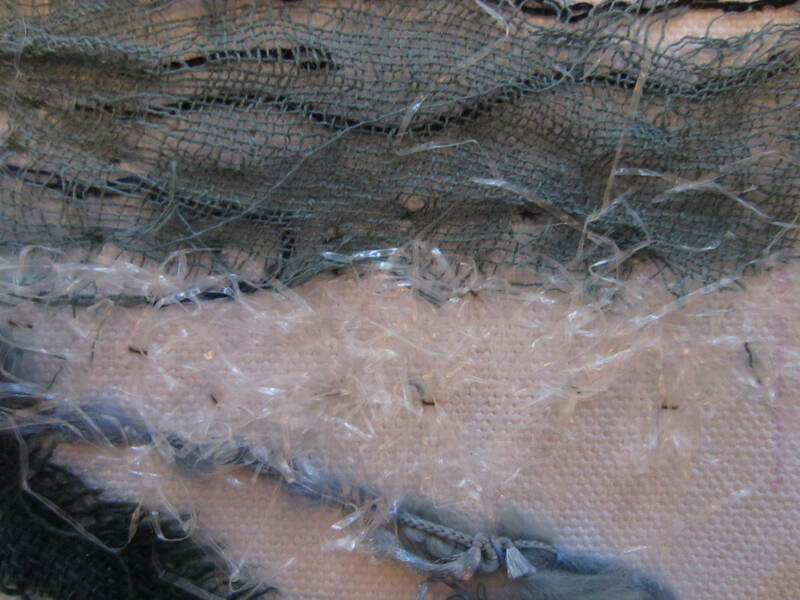 I then added pieces of plastic packing material to add a reflective quality. I was fairly pleased with the result and enjoyed matching the colours but was not happy that I had done enough to show the contrast between the rocks and the water as the rocks were not ‘heavy’ enough.